We’d love your help. 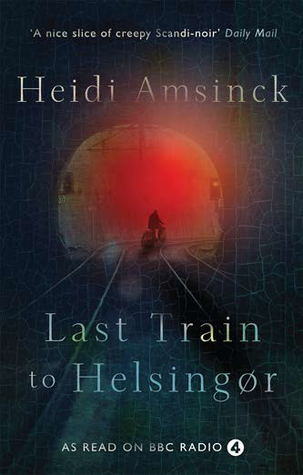 Let us know what’s wrong with this preview of Last Train to Helsingør by Heidi Amsinck. Copenhagen is a mysterious city where strange and sinister things often happen. Menacing and at times darkly humorous there are echoes of Roald Dahl and Daphne du Maurier in these stories, many of which have been specially commissioned for Radio 4. From the commuter who bitterly regrets falling asleep on a late-night train in Last Train to Helsingør, to the mushroom hunter prepared to kill to guard her secret in The Chanterelles of Østvig. To ask other readers questions about Last Train to Helsingør, please sign up. The title story, which opens the collection, is as though Jeremy de Quidt's 'The Wrong Train' has been rewritten for adults by someone who's recently read Robert Aickman's 'The Hospice'. It's a promising start, and many of the other tales live up to it. 'The Music Box' is a cautionary tale of a collector's lust for a cursed object; 'The Tallboy' spins an equally enjoyable scene around a similar premise. 'The Light from Dead Stars' is a crime story in which a police inspector, about to retire, is The title story, which opens the collection, is as though Jeremy de Quidt's 'The Wrong Train' has been rewritten for adults by someone who's recently read Robert Aickman's 'The Hospice'. It's a promising start, and many of the other tales live up to it. 'The Music Box' is a cautionary tale of a collector's lust for a cursed object; 'The Tallboy' spins an equally enjoyable scene around a similar premise. 'The Light from Dead Stars' is a crime story in which a police inspector, about to retire, is handed an unexpected clue to a a cold case that has long tortured him. 'The Bird in the Cage' is a nasty little fable like something out of Grimm. I loved the ghost stories 'The Man Upstairs', about an unseen neighbour and a 'ghastly' face at a window; 'The Night Guard', in which a man finds himself trapped in his favourite art gallery after closing time; 'The Crying', a very dark story in which an immoral and deceptive protagonist gets his comeuppance; 'Room Service', the tale of an inept chef and a strange request, which might have been my favourite. The weakest stories were a little too twee for my tastes: I wasn't keen on 'Like White Rain', 'The Ghost of Helene Jørgensen' and especially the rather smug 'Detained' for this reason. All in all, however, this is a really strong collection of noir and ghost stories with fantastic pacing and atmosphere. One to settle down with and read in a single sitting on a rainy afternoon or cold night. I purchased this anthology without knowing anything about the author, so I was a bit skeptical in the beginning but in the end I can say that the majority of the short stories satisfied me. You should bear in mind that I'm not an ardent fan of short crime stories as they lack the necessary plot development elements and proper characterization. ''Last Train to Helsingør'' made me invest some time in its reading and I found that some of the stories had great potential such as the titular one (the I purchased this anthology without knowing anything about the author, so I was a bit skeptical in the beginning but in the end I can say that the majority of the short stories satisfied me. You should bear in mind that I'm not an ardent fan of short crime stories as they lack the necessary plot development elements and proper characterization. These Danish short stories meander along the sinister side of twilight, weaving dark descriptions of despair, duplicity and justly-deserved retribution. The 19 haunting and subtle stories in this anthology come from author Heidi Amsinck who, although born in Copenhagen, writes fluidly and artfully in English. This makes her writing refreshingly accessible for an international audience – although you’re never in any doubt that these tales take place in the slightly strange Scandinavian landscape. These Danish short stories meander along the sinister side of twilight, weaving dark descriptions of despair, duplicity and justly-deserved retribution. This makes her writing refreshingly accessible for an international audience – although you’re never in any doubt that these tales take place in the slightly strange Scandinavian landscape. Some of the stories explore undeniably supernatural themes, but most are firmly grounded in the base desires of human nature. Charlatans and conmen get their comeuppance in these urban fables which lean more towards gothic horror than traditional fairy tales. Many of the stories are shot through with humour as dark as deadly nightshade. There’s frequently a sense of glee in how things transpire, when the tables are turned and the potential exploiter finds himself undone. Several of the tales explore the theme of escape, of simply walking away from modern society, from an over-crowded life full of white noise and broken dreams. Some of the stories edge into the uncanny and are genuinely unsettling; others are simply sad. None of them is particularly long, although there’s hidden depths between these brief pages. As can often be the way with multiple stories from one author, it’s best to read each tale on its own, with space for the scenario to flourish in its own right. Read a whole bunch of them too quickly, too close together, and they lose their identities and will merge into an amorphous muddle. This is a collection to be savoured, slowly, on cold nights when the wind is howling and you can imagine the ice forming in the corners of a disturbed soul. With thanks to the publisher for the copy received. Last Train to Helsingør is a collection of short stories all set in or around Copenhagen. They all have a similar theme, they are either concerning unscrupulous or lonely people or those who’ve something to hide. They have been accurately likened to both Roald Dahl and Daphne du Maurier. All of them were very good. I always read short stories over a few days, I find that I appreciate them more that way. There were none that I disliked and I have With thanks to the publisher for the copy received. Last Train to Helsingør is a collection of short stories all set in or around Copenhagen. They all have a similar theme, they are either concerning unscrupulous or lonely people or those who’ve something to hide. They have been accurately likened to both Roald Dahl and Daphne du Maurier. All of them were very good. I always read short stories over a few days, I find that I appreciate them more that way. There were none that I disliked and I have picked a few favourites. These were all different to each other and they were The Man Upstairs, Like White Rain and The Ghost of Helene Jorgeson. The latter reminded me more than any of the others of Dahl. Two of these were more sinister than the others, but all of the stories that feature are unsettling in varying ways. My first thought, and this was before I read a Q&A with Amsinck, was how much these tales reminded me of The Tales of the Unexpected (TV series from 1979 – 1988). A lot of the episodes were based on short stories written by Roald Dahl. The script writers often wrote endings or conclusions to the tales for the audience, whereas the stories they were based on were more inconclusive, open and mysterious. I grew up watching The Tales of the Unexpected, and much like the Hammer House of Horror an My first thought, and this was before I read a Q&A with Amsinck, was how much these tales reminded me of The Tales of the Unexpected (TV series from 1979 – 1988). A lot of the episodes were based on short stories written by Roald Dahl. The script writers often wrote endings or conclusions to the tales for the audience, whereas the stories they were based on were more inconclusive, open and mysterious. I grew up watching The Tales of the Unexpected, and much like the Hammer House of Horror and Graham Greene tales, the episodes were incredibly creepy and stuck in your mind for ages. Although the author has taken inspiration from certain sources it is fair to say that she has put her very own Scandinavian Noir slant on her tales. No tale is alike except for the unusual twists and creepy factor. Now and again there is also a question of justice, morality and whether everything is always black or white. Last Train to Helsingør – I bet there are plenty of people who sit on trains and wonder whether that train will end up taking them somewhere unexpected. You get a sense of lack of control, as you watch houses and fields whizz by, perhaps even more so when you can see nothing but darkness through the glass windows. The Music Box – Sometimes a curse isn’t just a collection of rumours, hearsay or Chinese Whispers repeated over decades. Sometimes a duck is just a duck, and a curse is really a curse. The Chanterelles of Østvig – Gudrun Holm has a conundrum. She must share her secrets with someone before she dies, and yet at the same time she has to protect said secrets from ever being found out. The Light from Dead Stars – This is one of my favourites too. Does the truth always have to come out? Are there people who deserve their destiny even if it is forced upon them? Is it always wrong to take things into your own hands? The Man Upstairs – Do you know a man or woman upstairs? I bet if you thought about it for a while someone would come to mind. A person who has always been there throughout time – with no explanation as to how it may be possible. In fact I might just go look in the upstairs window to see if I can get a glimpse of his face. Conning Mrs Vinterberg – You can’t con a con-artist or trick a possible serial killer, especially ones that look like friendly little old ladies. The Night Guard – The next time you go to an art gallery pay more attention to the details, perhaps some small element of the paintings change without you ever realising it. The Miracle in Dannersgarde – When is a miracle really a miracle and when is it just a coincidence? This is a story of faith being born unto the non-believer at a time when she needs it the most. Like White Rain – Angels come in all shapes and sizes, and in this case it is an old suicidal man and an abused young girl finding comfort and the will to live by helping each other. The Climbing Rose – This will make you wonder about the meticulous rose gardener you might know. The attention they pay to detail and the lengths they will go to to make the roses grow. The Wailing Girl – The moral of this story is to never assume you have experienced everything in life and that karma might want to have a word if you try and screw with someone. Room Service – When someone experiences the inexplicable the majority tend to side with the more practical and logical solution, because there is no such thing as ghosts right? The Ghost of Helene Jørgensen – This tale is about justice, but it is also about leaving everything behind and starting a new life. Cutting all the strings, both positive and negative, that keep you attached to a life you expected to be more than just a daily struggle to survive. The Suitcase – This tale is a bit like signing a contract with the devil, except you have no choice in the matter and your heart is dictating your actions. The stringent boundaries of OCD are skewed, which could be a good thing I suppose. The Tallboy – This one reminded me of the kind of horror the Hammer House stories were known for. The kind of mystery you want to solve, but are really too frightened of the truth to find out. Detained – What would make you crack? What kind of incident would make you re-evaluate your life and turn your back on everything and everyone? Do you think one scruffy man in an airport could make you think about what is really important in life? The Crying – I guess the moral of this story is that you deserve what you get, especially if you lied to get it. I wonder if the insanity was already there buried deep inside him or whether the apartment made him do it? Do what…why kill of course. The Last Tenant – Sometimes there is a reason a deal is a deal. A house that wants to draw you in, but doesn’t really want anyone inside at all. Once you’re in there is only one way out. The perfect run up to Hallowe'en next week, these short stories are best dipped into a few at a time. I found them eminently readable. Set around Copenhagen, they all shared the same feeling of inevitability and slight disorientation. Something is definitely not right in each of these scenarios. Its a feeling which seems to creep up on the central characters and adds to their creepy feel. The opening story and the one which gives the collection its name, Last Train to Helsingor, is a cracker. Wh The perfect run up to Hallowe'en next week, these short stories are best dipped into a few at a time. I found them eminently readable. Set around Copenhagen, they all shared the same feeling of inevitability and slight disorientation. Something is definitely not right in each of these scenarios. Its a feeling which seems to creep up on the central characters and adds to their creepy feel. The opening story and the one which gives the collection its name, Last Train to Helsingor, is a cracker. Who hasn't fallen asleep on a train, even if only for seconds and then woken up feeling slightly unsure of where you are? Mysterious faces at the windows and strangers who appear out of the blue. These are all features which recur within the stories. Another favourite of mine was The Chanterelles of Ostvig which had a real fairy tale feel about it. Of course, within most fairy tales there is a sinister, unexplained factor and this had that feeling. The central character, an old woman has an air of mystery and almost magic about her. The setting, and everyone she meets, seem to appear as if from nowhere. The events in these stories are unexpected and at times menacing. The people we meet can be obsessive or seeming to have something to hide. Each of the stories is brief but economical They are packed full of atmosphere and the feeling that something unexpected is just around the corner. In short: Short stories weave together a tapestry of an unsure and sinister world. This stunning collection of short stories was devoured over the course of a single evening. So much to love in here it is difficult to know where to start. Many of these stories are about running away, abandoning a life that is not fulfilling. In the title story a man on a train finds himself given the opportunity to leave his dull life for one where there are no cares. In 'Detained' a busy business woman takes a chance and leaves the corporate grind behind. Yet other stories tell of obsession lik This stunning collection of short stories was devoured over the course of a single evening. So much to love in here it is difficult to know where to start. Yet other stories tell of obsession like 'The Chanterelles of Ostvig' and 'The Bird in the Cage'. Others tell tales of people who will stop at nothing to get what they want like 'The Miracle of Dannersgade' and 'The Climbing Rose'. There is a darkness about these tales and they are perfectly told in a few pages. I look forward to more from Heidi Amsinck, a real find in the short story genre. I started this not really expecting to enjoy it but needing to read a Nordic noir book to finish my 2018 book challenge. I was however proved wrong and ended up not being able to put it down until I got to the last page. The short stories are an equal mixture of suspense and bone chilling tales. Best read by torch or candle light for added effect! A wonderfully creepy short story collection set in Denmark. Really enjoyed these stories - sinister but also darkly humorous and full of fascinating characters. They are also the perfect length. Really looking forward to her next book. I listened to three of the stories (including the Last Train to Helsingor) on BBC Radio. I very much enjoyed the three I heard. Very creepy! Tales of the bleeding obvious! It's not so bad but don't expect any good twists. Strange things wait for Borg when he wakes in a disused railway siding.